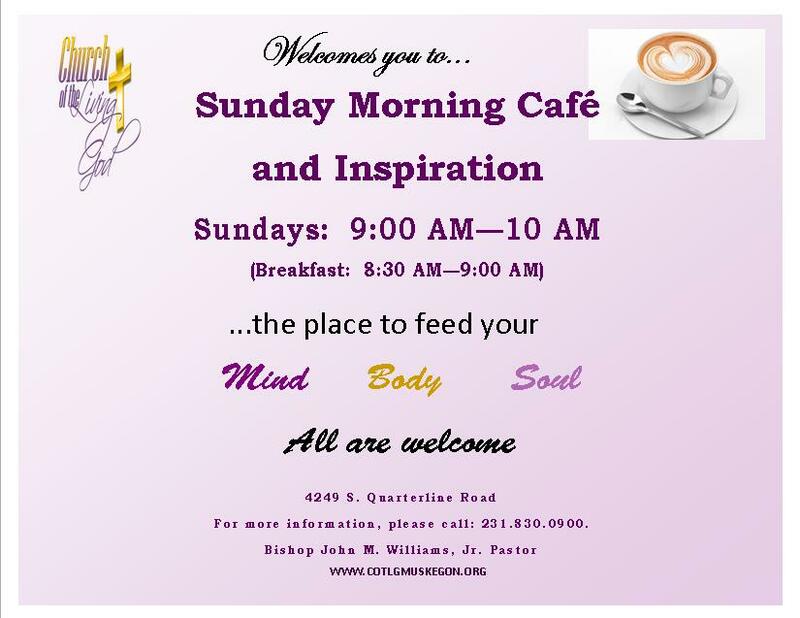 Feed your Mind, Body and Spirit in our 1 hour Sunday Morning inspirational service. We are a family oriented church, pursuing God's purpose for the family. The Church of the Living God is focused on love and built on the Word of God. We are building God's Kingdom one family at a time. Pursuing God's purpose for the family. Greetings in the name of the Lord Jesus who comes to give us hope! We are filled with gratitude for the support and care that you have shown to us for over sixty years that Church of the Living God has been home for my family. You have been a safe harbor filled with family and friends who nurtured our faith and strengthened my relationship with God. This community has welcomed me as a pastor thirty-five years ago and then embraced me as Bishop. Throughout this time, your deep faith and generous spirits have given us a great deal of hope. We know that we will continue to accomplish great things together as we open our lives to the power and presence of God in our midst. Already recognizing the challenging times in which we live; and despite the economic, social and cultural difficulties we face such as high unemployment, divisions amongst people that separate us from one another, and a society often focused on consumerism and individualism; as the church, we must focus our energies instead on the Gospel of love. The viable twenty-first century church must look to the needs of four or five generations. We must compete for every inch of ground, stand fast on the Word of Christ and be willing to venture into new directions with the twenty-first century spiritual weapons and teaching. We thank God for our great leaders of the past, but our new and future leaders will minister to generations of people whose thoughts and values are far different than those of the past. We must face these challenges head on and our witness should bring into focus God’s desire for a powerful twenty-first century church! We envision every member of the Church of the Living God working together to become a beacon of hope as “Proclaim the Gospel of Jesus Christ” and seek to build strong faith-based communities just as Psalms 133:1 reads: “Behold, how good and how pleasant it is for brethren to dwell together in unity”. Finally, I thank you for enduring the rough water of transformation and for making great sacrifices along the way. Your efforts do not go unnoticed. Bishop John M. Williams, Jr.
Church of the Living God, C.W.F.F.